My 13yr old and I normally do DSO imaging. 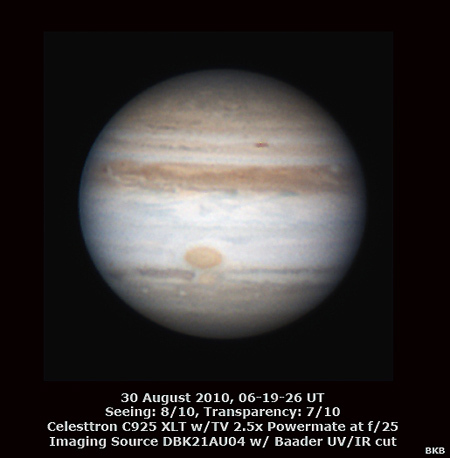 We want to get back to some lunar/planetary visual observing BC we feel our observing has been neglected and sort of taken over by DSO imaging (no surprise there!) So we want a scope that will fulfill a dual roll of 1) planetarty/lunar observing + 2) planetary/lunar imaging as we have never tried this sort of astrophotography. Our astrophotography mount is an iOptron CEM-60EC so we can carry a heavy payload easily so no issues there. The 2 I've sort of been considering are these. I have owned an 8in SCT way way back in the day but have never owned a Mac Cassagrain or a modern newer SCT or an RC. I understand the design difference, but don't really know anything about the image quality difference. Any recommendations based on real world usage would be much appreciated! Edited by flyboy9990, 22 March 2019 - 09:17 PM. What is the scope you have now? No DSOs with the visual scope? Depends on your budget, but frankly, get the largest aperture you can get within reason of your local seeing conditions and how long you're willing to wait (or work) on thermal acclimation. My thoughts here are a standard Celestron C11 as a good balance of aperture and size to cost. A C14 would be phenomenal. But, a beast in its own right, expensive, and quite heavy. A C8 is a great entry tool. You can get wonderful resolution out of a C8 for planets and the moon. If budget is a concern, I would get this. I would get a C8 over a 200mm (8") reflector too because you get all that focal length and control imaging scale easier and the compact nature of the SCT design makes it very easy to mount, it will be very stable on your CEM60 and will hardly wobble when focusing. Do not bother with an RC design for planets/moon. The large central obstruction lowers contrast and reduces surface area that otherwise would have passed light. Stick to scopes with longer focal ratios and smaller central obstructions if you're into folded optics. I have a C8, but if I was doing it again I would get a C9.25 for planetary. Also get a 2x barlow and a ZWO ASI224MC, a good mount (something heavier than an AVX - say the Atlas), and you are in business !!! Love my C-8/E. Have done some short run video on my Ioptron CEM25P and AZ Pro with my Nikon. If I had to chose again I would get the 9.25. The only reason I personally would not step up to the 11" is simply age/size/weight/mount. Since you want also to observe, a Schmidt-Cassegrain makes a lot of sense. EdgeHD's flat fields could be useful for the Moon. I didn't know this was avaliable a 7in Mac Cat by skywatcher. It's 1 inch smaller than an 8 but smaller central obstruction. Any thoughts on this compared to an 8 SCT? - 1inch but smaller central obstruction? But yes I see the 9.25 is about the same price as the 7in Mac. We image from city backyard but also our beloved remote dark sky site. I'm kinda with Marty and the C11 suggestion if portability and size are less of a concern. Put a 2" Visual Back on the C11 and get a decent 2" diagonal. Then you can also use the diagonal in the GT71 for sweeping views from your dark site. I would certainly like to go with the C11 we could handle that easily. The RASA11 is a handful at about 43lbs ish so were good with that as far as portability. But that 2K price or so isn't in my budget I'de have to save some for a planetary camera. So I guess it's sort of boiling down to maybe 2 options. I'm really on the fence about it bc I get the bigger aperture thing, but on the other hand there seems to be lots of loyalty to Mac Cas designs due to sharpness. Supposidly the mirror is easier to make for the Mac Cas so it is generally made better than commercial SCTs. Or so I've read! Is it likley that the shear aperture increase of 2.25in would overcome the advantage of a smaller central obstruction? Especially if plan to do AP, will do a favor to yourselves by getting the 9.25"
I see what your saying. Go for the shear aperture!!!! I may indeed have to do that. Yes we do want to try planetary/lunar imaging as well. Were constantly looking on astrobin at ppl's fantastic solar system imaging. 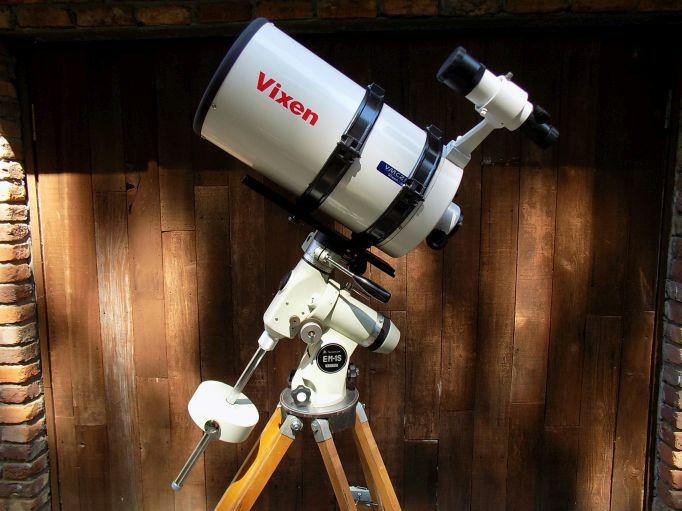 Plus the visual part of it last summer we set up my old Nextar short tube 80 just for fun and even in that too short focal length we had an absolute blast watching the summer parade of planets and looking at the moon. It sparked, or more correctly, ignited with gasoline, the interest in astronomy in my son. We've been off and running ever since! 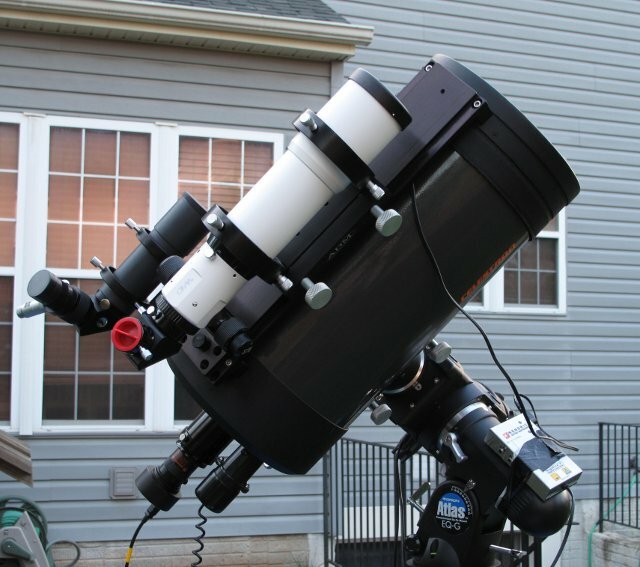 I'm going to plug for the Celestron EdgeHD 11 for lunar and planetary work...and then some. I think it is great you want to have a go at lunar and planetary imaging and visual work, the EdgeHD 11 will deliver for you in spades. But you are also DSO imagers, so that same scope will take you pretty deep for small scale targets. And visual views of M13 and other globular clusters are particularly fantastic (and I live under Bortle 6 skies). I certainly would love one of those! But we just bought a RASA11 so my budget is maybe around 1k or so. That being said, and sticking to the SCT idea, would your recommendation be to go with as large apature as I can afford? Say the 9.25 over the 8 ? Looks like you have some good experience with this type of imaging. Edited by flyboy9990, 23 March 2019 - 10:08 PM. Great I think this is the best option for us! I hadn't thought about an electric focuser but I see your point. Which one is that you have shown in your photo? Whatever your choices are, aperture is where you need to go if you want to resolve planets & lunar surface. The C9.25, if in your budget, is a great option compared to a smaller aperture Mak-anything, losing significant aperture in a 7", even if the optics are better (though Intes for example is not in this budget range). Alternatively, a 12" reflector is in your budget easily and your CEM60 could handle one. I hadn't really thought about a reflector. I'm guessing your talking about something like the Skywatcher? A C8 is a great entry tool. You can get wonderful resolution out of a C8 for planets and the moon. Same aperture, but it's a Field Maksutov rather than an SCT. In theory, the open tube design temp adapts faster, but temps at The Swamp are mild, so that really doesn't matter. It's a bit lighter. It has a standard rack & pinion 2" focuser, so no mirror shift. But, the spider vanes are thick. It's severely bottom-heavy, that can make balancing tough on some mounts. Collimation is trickier than the Celestron SCTs, and it MUST be collimated correctly. 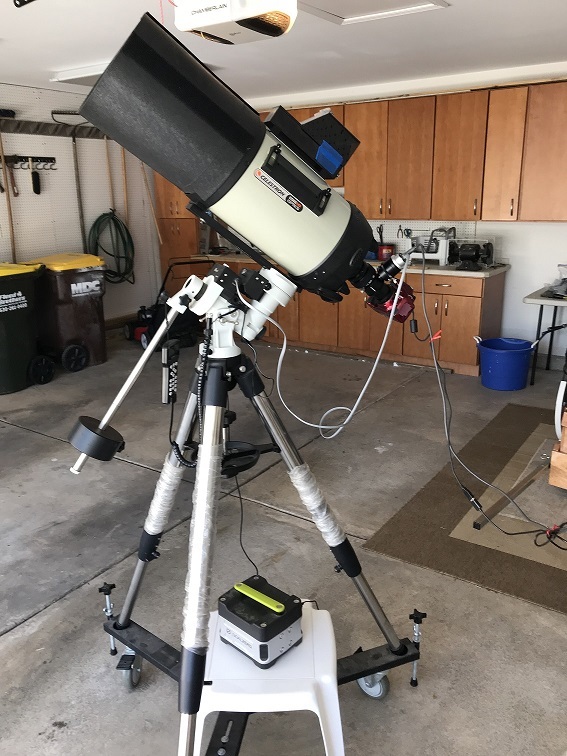 The views are refractor-like, but it sure beats an 8" F10 refractor for portability! Prices for brand new ones are crazy high. My used one's price was comparable to a C8 OTA. Would it be crazy to use a barlow or powermate with RASA for casual imaging of the moon and the larger planets when you don't want to deal with dismounting the huge RASA ? 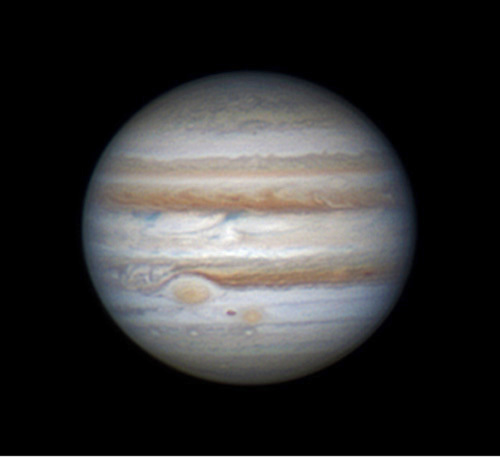 You could get a fairly decent focal length with a 4x or 5x but I don't know at what point you would lose resolution compared to a native long focal length planetary scope. I remember that scope the VMC200L. I admit i love gear shots! LOL I was out of astronomy for a while when I first had kids but now my son is 13 and everything is space space space with him so we dove back into it hot and heavy. I'm not really sure if there's a way to hook up something like a powermate or barlow to our RASA. It has a very spacific distance to sensor requirement and bc of the rather unusual design of the camera being at the front, it does seem limited on set up options. But we love the f/2.2. Were learning how to use it but Sat it was clear and we did a shot from heavy city light pollution unfiltered. The wonder machine gathers so much light so fast we had to dumb the camera down to ISO 100 and only 20sec sub frames. We need to get it out to our remote dark sky site to realize the full potential of an 11in mirror operating @ f/2.2. I'de consider it non practical bc of the set up limitations for planetary/lunar. From what I gather from all those that responded for our stated purpose of lunar/planetary visual/photo, it sounds like aperture is king! I believe for our current limited budget the C-9.25 will be our sweet spot! Edited by flyboy9990, 25 March 2019 - 10:14 AM. A C14 would be phenomenal. But, a beast in its own right, expensive, and quite heavy. It's not heavy. I've used it for 17 years. Now the fork mounted 10 inch Meade LX200 I moved yesterday is HEAVY. The only scope I've needed to use wheels to get it into the garage. Edited by gnowellsct, 25 March 2019 - 10:15 AM. I always go for the best optical figure and contrast which would be the 7" MCT most likely for visual. For imaging quality aperture. 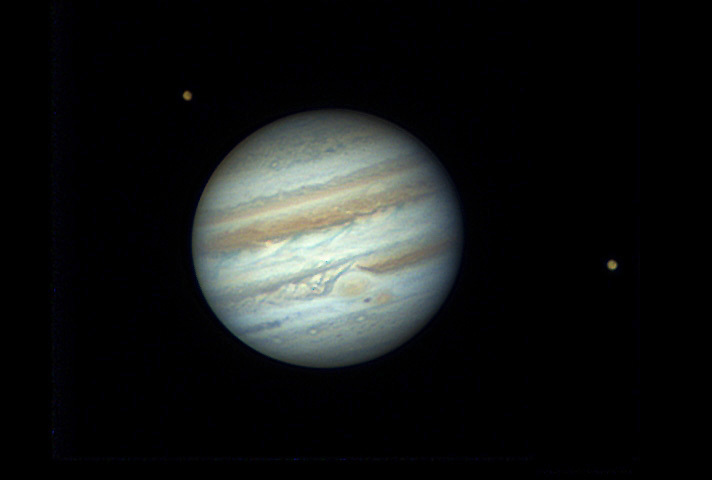 The 9.25" Celestron would be fine if you can get a good example. Maybe I'm a little slow... but what would be the benefit of and Edge over a SCT for planetary? When imaging planets, you not imaging the entire field buut concentrating on such a small area with f/ ratios well over 20. A flat field is nice, but I do not see the advantage in strictly planetary. I will also echo the need for a finer focusing mechanism, a little shift in the mirror and the entire planet can become lost... It is rather frustrating. You are absolutely correct. My friend said it must be the placebo effect.